Create your own Lexmark Pro915 inkjet pack / bundle with our flexible quantity discount pricing. Mix and match products so you are only purchasing what you need, but also maximizing your savings. Compatible Cyan Ink Cartridge with 700 high capacity page yield. Equivalent to Lexmark part number(s): Lexmark #150XL Cyan, 14N1615, 14N1642. Fits the following model(s): Lexmark Pro915. Compatible Magenta Ink Cartridge with 700 high capacity page yield. Equivalent to Lexmark part number(s): Lexmark #150XL Magenta, 14N1616, 14N1646. Fits the following model(s): Lexmark Pro915. Compatible Yellow Ink Cartridge with 700 high capacity page yield. Equivalent to Lexmark part number(s): Lexmark #150XL Yellow, 14N1618, 14N1650. Fits the following model(s): Lexmark Pro915. Compatible Black Ink Cartridge with 750 high capacity page yield. Equivalent to Lexmark part number(s): Lexmark #150XL Black, 14N1614, 14N1636. Fits the following model(s): Lexmark Pro915. Buy our high quality compatible ink for Lexmark Pro915 with confidence. Join thousands of happy customers who have found our compatible products are equivalent in page yield and print quality. For our compatible products, we offer a 100% Satisfaction Guarantee allowing you to return products within 6 months if you are unsatisfied. 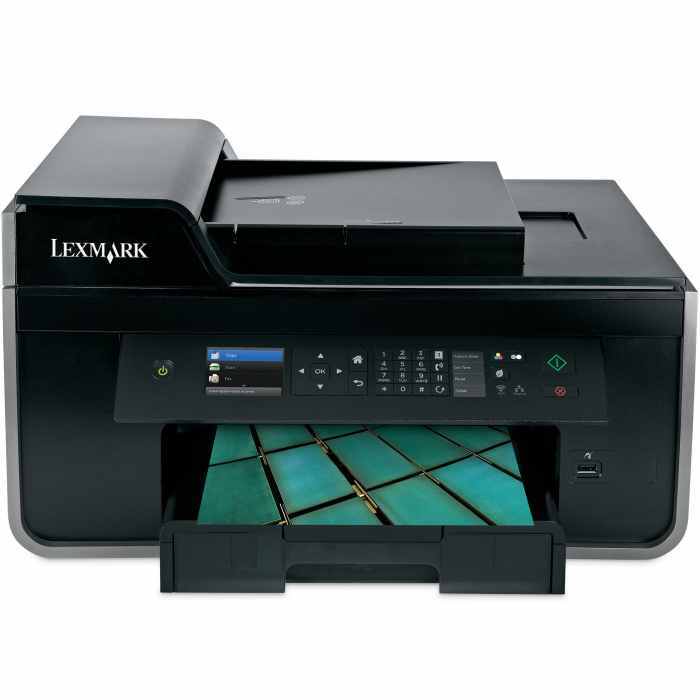 The Lexmark Pro915 includes the usual all-in-one inkjet features of printing, scanning, copying, and faxing, and more than a healthy amount of web connectivity as well. It can print at up to 35 pages per minute in Draft mode, but expect slower results at higher quality settings. 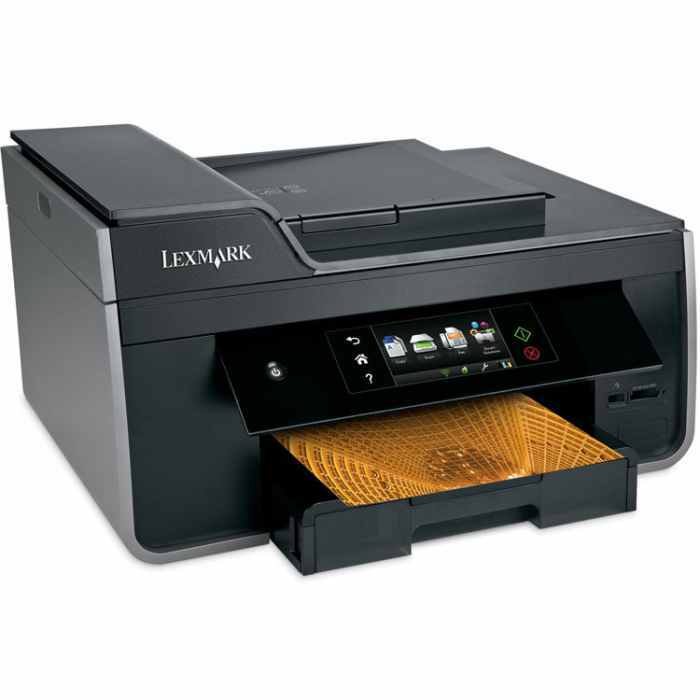 High-capacity Lexmark Pro915 printer ink is affordable, especially for third-party supplies. The Pro915 is a bit on the large side for a home all-in-one machine, but this isn't surprising given features like the 50-sheet automatic document feeder for quick scanning and copying, and a roomy 150-sheet paper tray. The device measures 9.9x18.3x15.9 inches, with a weight of 20.3 pounds, so it is still compact enough to share a desk with, but just barely. Where the Pro915 shines is in its web-enabled features. It can connect via ethernet to a wired network, or it supports 802.11n networks for fast wireless connection. The 4.3-inch touchscreen gives users access to specialized apps that can provide a variety of functions, like printing web photos, finding and printing office templates, and more. Digital workflows save Lexmark Pro915 ink and also paper, so utilizing features like Scan to Email and Scan to PDF can significantly reduce costs. The unit also offers automatic duplexing that also reduces paper usage. Purchasing the OEM Lexmark Pro915 ink cartridges can be a little expensive, though this model is more affordable than earlier models. A better alternative is to use compatible Lexmark Pro915 printer ink cartridges from third-party vendors, and choose the "XL" high-capacity versions, which offer page yields of 700-750 pages each, as opposed to the standard supplies, which yield only 200 pages each. With a great web-connected feature set and solid paper capacity, the Pro915 inkjet printer could easily handle the needs of a small office. Its low retail price and affordable supplies give it a lot of value for the price.